Vogue Crafts & Designs Pvt. Ltd.: Different Type of Handmade Earrings For any Outfit that Girls can Flaunt! Different Type of Handmade Earrings For any Outfit that Girls can Flaunt! Girls always get confused between the jewelries, while if anyone checks there collection it would be brimming with beautiful jhumkas or necklaces. But she would hardly wear such jewelries, or you can say maybe once in a week she might try and open her collection and look for the matching earrings or necklaces to wear with her attire! One should know there are certain jewelries which can match up with your any outfit. Listed below are some different types of handmade earrings which one can wear without thinking twice about matching it with the attire. Beaded earrings are very common these days; one can pair these up with any outfit regardless of its color. You can simply wear a designer beaded earring and also the amazing part is you can wear such earrings in the social gathering or for your college party and also for you normal days at college. Tassel Earrings: These Earrings are one of the most delightful types of earrings; a beautiful tassel earring adds another dimension to your look and makes you look stunning at the same time. Further, as these earrings are handmade they are made with care and instantly give spice to you any outfit. Feather Earrings: The Name itself defines the type of earrings they are, for every girls daily wear this type is a must. If you are getting late or want to just wear a pair by not overdoing it. I would suggest you can go for these earrings without giving it a second thought. Further, the feather look gives these earrings a scintillating look. Hoop Earrings: Hoop earrings are the most common type of handmade earrings and are very easily made at home without any labour. They look best when paired up with kurtis, but can also be teamed up with you casual jean and top. Huggie Earrings: Even if you do not like wearing earrings or accessorizing yourself, you can just pick these earrings and team up with any outfit it would give you that beautiful glance and make you look charming at the same time without much efforts. 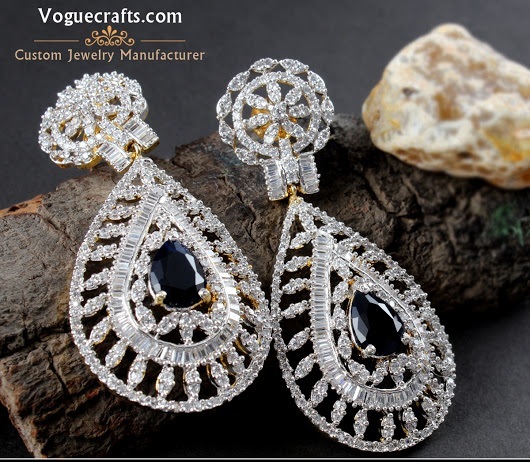 Dangler Earrings: These are those types of earrings which can give you that cheeky and charming look and also handmade earrings can be of a type where one would love the style of the dangled earrings as they are not made by machines. So, these were just a few types of earrings but there are many more of the kinds. Also if you want to get the monopoly of your jewelry, you can always customize your jewelry and acquire that classy look. You can refer to http://www.voguecrafts.com/ for further details.